Sure, every human being has thought that, as we age, we would like to have a small garden or a farm to grow our farm products and enjoy the peace of mind leisurely Every morning, we get fresh air in quiet countryside, no traffic noise or smoke makes us tired. How beautiful is that vision, so before you get your dream farm, do you want to explore it? 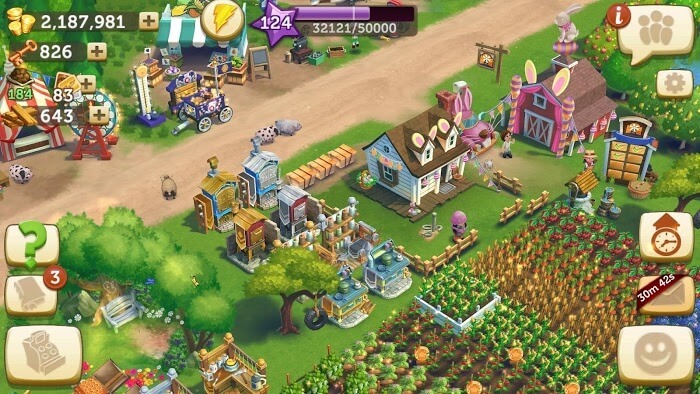 Join FarmVille 2: Country Escape. 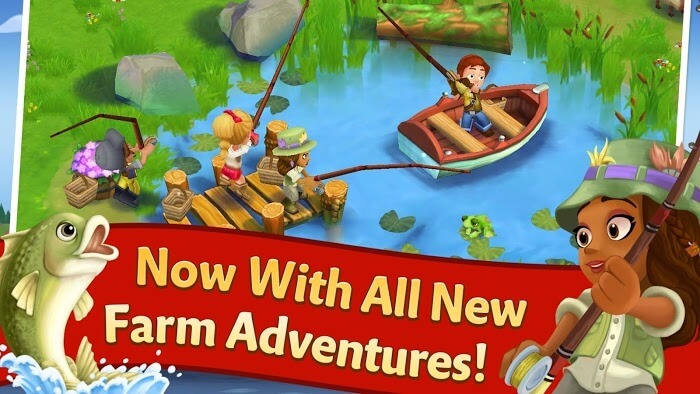 This farm game will take you to the countryside, a peaceful place to relax your soul. Rogue’s grandfather is now 80 years old. They had a vacation in Hawaii in the summer when Rogue graduated. They talked to Rogue about having a farm in the north of Jackson Hole, Wyoming. They have been attached to the farm for 30 years, which is their wish, but perhaps because of their frail health that they can no longer afford it. They have not been there for quite a long time; They want you to go back to the farm and continue to grow them. However, it seems that the recent storm has caused the farm to deteriorate, ruining everything and turning it into ruins. But do not worry Marie – an old friend of your grandparents will be with you to re-develop here! Starting with the most basic things, you will have to repair works like warehouses or some cages. Then start planting and buy more livestock such as cows, chickens, pigs …. and begin to put the farm into normal operation. Initially, Marie will guide you to do some work and help you get acquainted with the work here; then you will have to take care of everything. Each product must go through different stages, such as growing rice, watering, deep-seeding, fertilizing and waiting for a period for the plant to grow. Once all is settled, the tasks that you need to do will gradually increase the difficulty, which will require you to speed up the process. Try to earn gold to upgrade your farm and buy more machines for your farm! 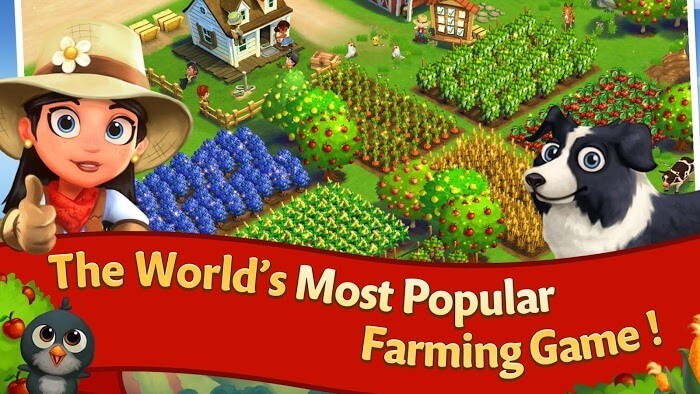 According to some well-known sites such as Pocketgamer and other players around the world, Farmville 2: Country Escape is the most detailed and beautiful farm game in the Farmville series. All characters and models in the game are painted in 3D color, but it is still designed in cute cartoon style. Graphics are a highlight of the peace in the painting that Zynga painted. The sound is another strength of Farmville 2: Country Escape. The game brings the funny noises, the sounds of the pets, the sound of the winds. And indispensable is the gentle country music to help players relax entirely and leave the worries in real life. 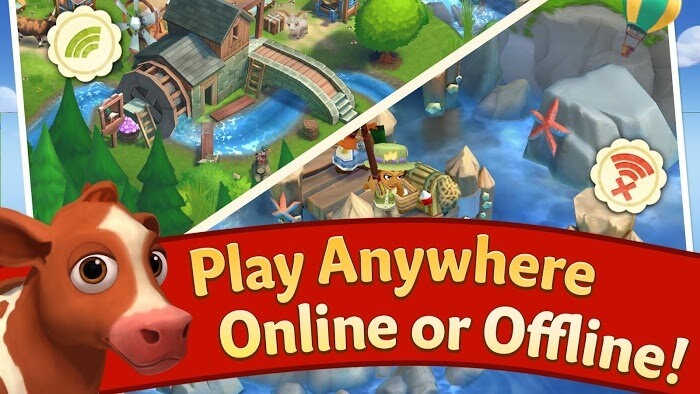 Let’s get rid of the fatigue of everyday life and return to the peaceful countryside with FarmVille 2: Country Escape. You can build your career with bumper harvests, and a pleasant garden brings. Also, you can link this game to Facebook or Gmail to play with your friends!